Geology is not just about rocks and minerals. It is about incredible stories that help explain the past and how the world we know today formed. Geology is full of connections of how our geologic past is directly connected to the present and future. The giant teeth of the Megalodon shark are related to the flavor of your soft drink and to the fertilizer that helps grow your vegetables! 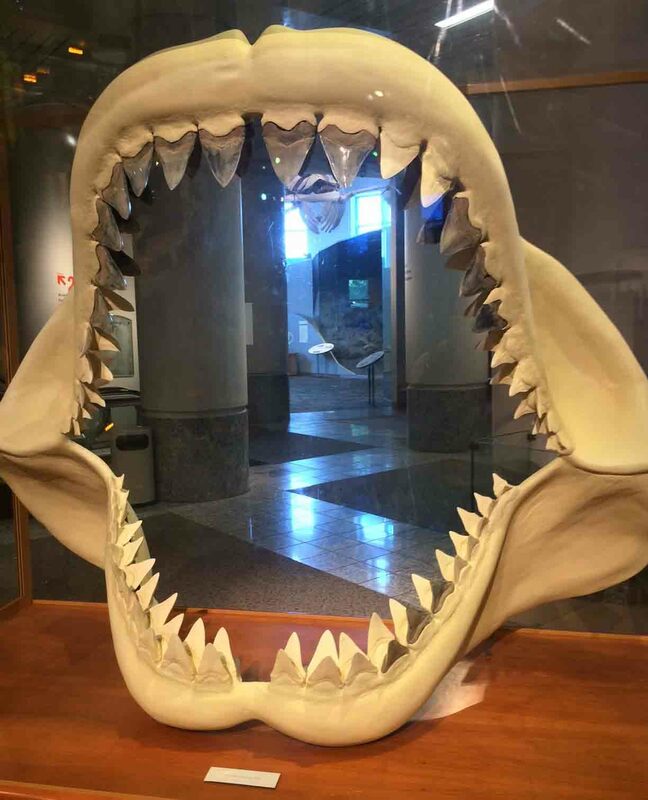 One of the most intriguing exhibits at the North Carolina Museum of Natural Sciences is the jaws of a giant shark (Megalodon). Megalodon sharks grew up to 50 feet long and hunted whales, fish and other marine life off the coast of North Carolina approximately 3 to 15 million years ago. Many Megalodon teeth as well as the bones and shells of many different marine creatures have been found in a phosphate mine in Aurora, NC. The ancient animals were drawn to the coast of North Carolina due to the upwelling of abundant nutrients in the ancient ocean. These nutrients allowed for abundant biological activity ranging from tiny plankton to the giant sharks. The area was so rich in nutrients that some of the elements precipitated out and formed deposits containing the element phosphorus. The phosphorus is present in the sediments as phosphate. The phosphate is mined, processed and used in a variety of commercial and industrial applications including: 1) as a fertilizer that helps crops (the food you eat) grow; 2) as an additive to feed for animals; and 3) in industrial products like soft drinks (phosphoric acid is added in soft drinks to give a sharp flavor and as a preservative), food additives and metal treatment. State Parks of North Carolina let you interact with geology. North Carolina is fortunate to have an excellent State Park network. Several of the State Parks were established because of exceptional geologic features. These parks serve as a hands-on and an interactive means to the teaching of earth science in which geologic concepts can be taught using real-life examples. Examples of State Parks established because of exceptional geologic features include: Stone Mountain, Raven Rock, Cliffs of the Neuse, Hanging Rock, Pilot Mountain, Medoc Mountain, Morrow Mountain, Gorges, Crowders Mountain, Jockey’s Ridge, Lake Waccamaw, etc…..
See The Geology of North Carolina State Parks and Other Protected Areas web page.